I am really trying to support independent brands recently, scouring Instagram, not on the highstreet and Etsy for new independent goodness. When I saw the #Derbyshirespringmarket advertised on Instagram I text my friend Laura with a YOU BETTER GET THIS DATE IN YOUR DIARY kinda text. I didn’t realise at the time that the spring market wasn’t just a one off but in fact a group of events run by Deb of Fabulous Places. She offers the chance for numerous independent brands to showcase themselves several times a year within the Derby Roundhouse (what a building) and its the perfect event which brought all my Instagram dreams to reality. The first stand we visited when we arrived was LetterBox Lane and I’m still kicking myself for not buying the birkenstocks and blossom print. Letterbox Lane has so many beautiful, fun prints as well as cards. I am working on redecorating our back bedroom and want to incorporate everything that LetterBox Lane embodies in a gallery wall. Definitely worth a look for some super fun prints for your home. I like to buy quality leather goods – I’m always happy to pay a bit extra if I know an item is going to last me.Orgill Organics is a stand I was practically drooling over – so many handcrafted beautiful leather bits, and I couldn’t believe when I saw the prices too. Keyrings, satchel bags – even a little leather hanging planter. I had to snag myself a fab little luggage tag for our holidays though. How stinking cute? Bows Beaus was probably one of the busiest stands in the room, and for good reason. It’s basically like my brain vommited up my future childs bedroom. 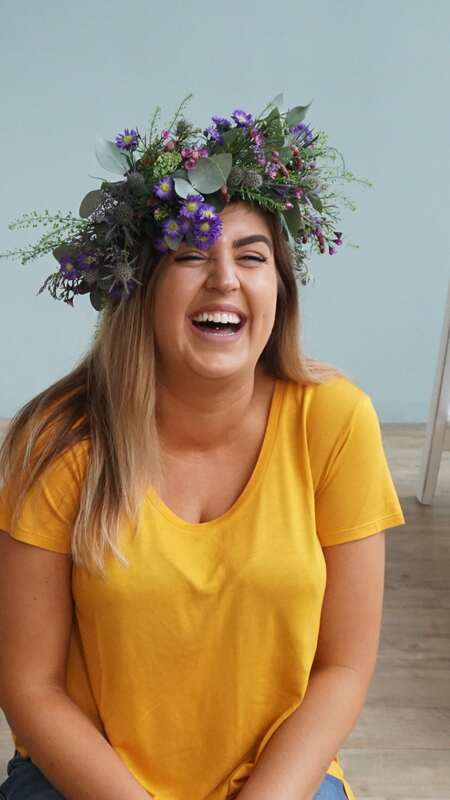 The fabric crowns are something I reaally want however- It’s okay for a 27 year old to wear a crown on her birthday surely? The animals were personalisable and would make the dreamiest cake toppers. YAAAAS please. Our house is basically a Darwin and Gray showroom with one of their banners in basically ever room. I ordered my first ‘commission’ from Stacey back in 2011 and it still hangs pride of place in our living room. I have her ‘Get Naked’ banner in our bathroom, a ‘Make Yourself Proud’ banner hanging on my board at work. I’ll never tire of the goodness that Stacey creates and loved getting to see her products in real life was fab. She is so talented and to see how she has grown since my first order is outstanding. I’m really enjoying finding some wonderful independent brands and would love to hear if you have any suggestions? The above are definitely worth a follow online – so much talent packed into those grid squares! I’ve always like crafty things, but never thought of going to a market or event for that kind of stuff. I think alot of people associated countryside or traditional markets with elderly past times; today it seems like it’s popular among all ages. Maybe the likes of Pinterest, Instagram and Etsy have changed that stigma.